Microsoft's Windows 8 operating system will ship with two new recovery modes called Reset and Refresh that users and administrators can use to reset the computer to factory state or to refresh it to a "good state". The terminology may be confusing at first. 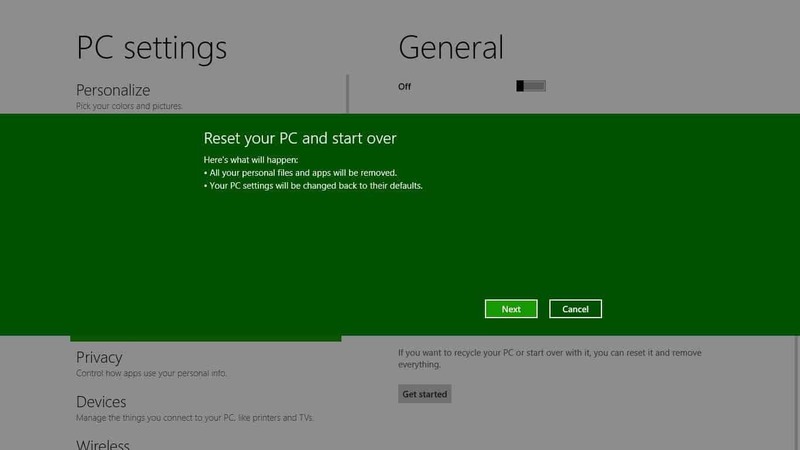 The reset option basically removes all personal data from the PC before reinstalling Windows 8 on the computer system, refresh on the other hand restores some data on the system after reinstallation of the operating system. 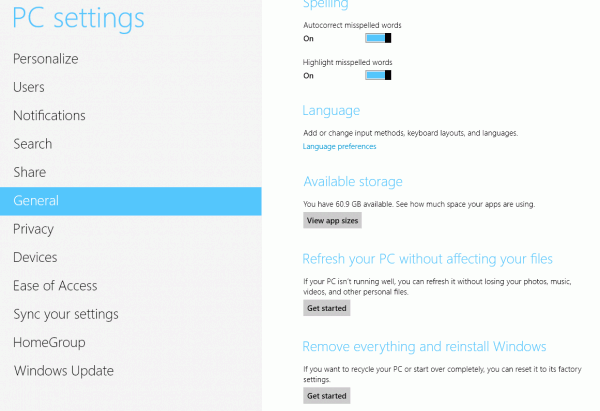 Microsoft details both troubleshooting and repair options in a new blog post on the Building Windows 8 site. Windows performs several operations when the reset option is selected. The PC is booted into the Windows Recovery Environment, data on the Windows partition is erased, and the hard drive formatted which means that all personal data on that particular partition will become unavailable. A new copy of Windows 8 is then installed, which is then loaded once the PC restarts. A refresh on the other hand preserves some of the personal data that is already on the PC. The process is nearly identical to resetting the PC. The only difference is that Windows 8 backs up data, settings and metro apps on the same drive to restore the data after Windows 8 has been reinstalled on the computer system. Windows 8 will only preserver Metro style apps, and not desktop applications which may seriously increase the the configuration and setup time after the refresh has been completed. First, in many cases there is a single desktop app that is causing the problems that lead to a need to perform this sort of maintenance, but identifying this root cause is not usually possible. And second, we do not want to inadvertently reinstall “bad” apps that were installed unintentionally or that hitched a ride on something good but left no trace of how they were installed. System configuration settings that will be preserved include the PCs wireless network connections, mobile broadband connections, drive letter assignments, personalization settings like the desktop wallpaper and Bitlocker settings. Some settings will not be restored though "as they can occasionally cause problems if misconfigured". This includes display settings, Windows Firewall settings as well as file type associations. Windows 8 does ship with options to define your own baseline image for refreshing operations. The core benefit here is that this makes it possible to restore desktop applications as well. Here is how this works: Configure Windows 8 the way you want it to be. Install applications and make changes to the system. Once you are satisfied you run the following commands on an elevated command line prompt to create the baseline image. You can naturally place the image into another directory, for instance on another partition or drive. Windows will automatically register that baseline image for use when the refresh option is selected by the user. 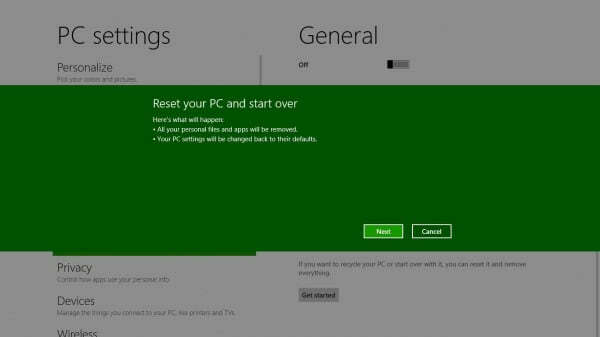 Microsoft has tested the resetting option on the developer preview PC that they handed out at the BUILD conference. A quick reset of the Windows 8 PC took 6 minutes and 12 seconds to complete, a more thorough reset with BitLocker enabled 6 minutes and 21 seconds, and a thorough reset without BitLocker 23 minutes and 52 seconds. Why the big difference between PCs with BitLocker enabled and disabled? Microsoft is only erasing the encrypted metadata on BitLocker enabled devices which takes significantly less time than erasing all data on the drive. A refresh of the PC took 8 minutes and 22 seconds. Can data be recovered after a reset? This depends. Microsoft mentioned that they will provide options in Windows 8 Beta to erase data more thoroughly to limit the effectiveness of data recovery attempts. The thorough option will overwrite every sector of the partition with random data. Reset, Refresh and System Restore: System Restore serves a different purpose. It is mainly used to undo a single change on the system, for instance the installation of a new system driver that is causing issues on the system. What can I do if the PC does not boot into Windows 8 anymore? Both refresh and reset options are available when booting into the Recovery Environment. Here is a video demonstrating the refresh and reset functionality. Update: Windows 8 has been released officially so that it is necessary to take another look at the operating system's refresh and reset feature. Press the Windows key to open the start screen interface if you have not been there already. 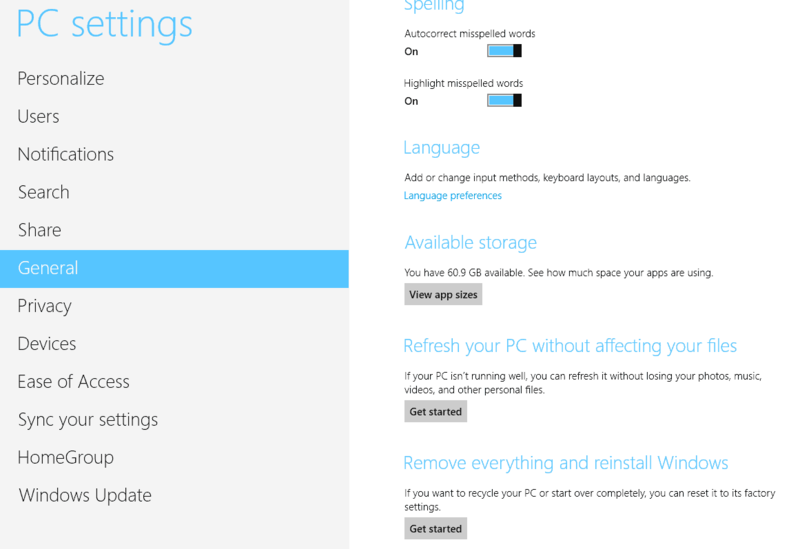 Select Settings > Change PC Settings from the options here to open the start screen specific settings. This is a different set of settings than the Control Panel makes available. Switch to the General listing here and scroll down until you see the Refresh and Reset options on the screen. Refresh your PC without affecting your files - If your PC isn't running well, you can refresh it without losing your photos, music, videos and other personal files. Remove everything and reinstall Windows - If you want to recycle your PC or start over completely, you can reset it to its factory settings. Note that the reset feature has been renamed to make it more clear what is happening when you run it on the system. It is basically still the same feature though. Just click on the get started button underneath the option that you want to make use of. When you do that, you get to a screen that highlights exactly what is going to happen when you continue with the operation. If you have multiple partitions, you are asked during the process if you want to cleanup all partitions or only the one Windows is located on. This can be useful to avoid deleting data on another drive or partition that you use for storage only. Click on the "show me the list of drives that will be affected" link here to make sure only the drives that you want to reset are included in the operation. You are also asked how to remove the personal files. Windows can either overwrite the data which takes longer but is more thorough and especially useful if you are giving the hard drive or PC away, or quickly, which is faster but makes it more likely that data can be recovered with file recovery software. I am still confused. So reset will format your hard drive and reinstall windows? and refresh acts like system restore? If thats the case then how is this new feature? it won’t be available until the mid of this year, right? I’d estimate it to be released no sooner than the 3rd quarter, more likely the 4th.